September 23, 2015 9:30 A.M. 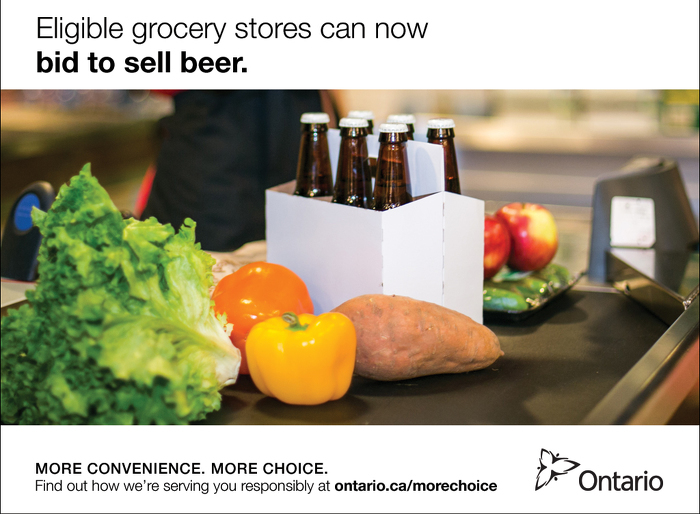 In a move that offers consumers more convenience and choice while maintaining a strong commitment to social responsibility, the Ontario government is now accepting bids from grocery retailers interested in carrying beer. Premier Kathleen Wynne made the announcement today with Ed Clark, Chair of the Premier's Advisory Council on Government Assets. This is a key step forward in the biggest change to alcohol retailing in Ontario since Prohibition was repealed nearly 90 years ago. The government has established specific eligibility criteria to provide the best value for consumers while ensuring that small and large grocers, and all regions of Ontario, are fairly represented. Beer sales will be expanded to grocery stores starting with 60 locations, to be announced in December 2015. As part of Ontario's commitment to social responsibility, grocery stores interested in selling beer must commit to meeting strict requirements for the safe retailing of alcohol, including standard hours of sale and rigorous training for staff. Savings for brewers that are not current owners in The Beer Store network. The arrangement also includes a commitment from the industry's largest brewers to cap price increases to inflation for some of their most popular beer products until May 2017, unless there are material changes to the industry. Providing convenience and choice for consumers and more opportunity for small brewers is part of the government's plan to build Ontario up. The four-part plan includes investing in people's talents and skills, making the largest investment in public infrastructure in Ontario's history, creating a dynamic, innovative environment where business thrives and building a secure retirement savings plan. Under this initiative, up to 450 grocery stores across the province will be allowed to sell beer — including up to 150 by May 2017. Interested grocery retailers can register at www.biddingo.com under LCBO RFB #2015-010. The deadline for submissions is November 6, 2015. A third-party Fairness Commissioner will oversee the bidding process. The Premier’s Advisory Council on Government Assets conducted extensive industry consultations to define a fair and socially responsible model for beer sales in grocery stores. The new beer agreements and grocery store allocation process meet key principles laid out in the Council’s final report, released in April. Grocery store retailers will not be subject to a strict cap on sales. When fully phased in, should sales across the grocery network exceed $450 million, grocers whose sales exceed their share of that global cap will pay a small fee. The Alcohol and Gaming Commission of Ontario will be responsible for appropriately regulating the new private retail channels. Since April, Ontario has made significant progress to modernize beer retailing, including a pilot program to sell 12-packs at 10 LCBO stores, free listings for Ontario brewers at The Beer Store, new on-site sales outlets for small brewers, and new Craft Beer Zones at 25 LCBO locations across the province. The LCBO has a strong history of supporting the Ontario craft beer industry. Since April 1, LCBO has listed 52 new craft beers. And in 2014–15, the sales of Ontario craft beer grew at LCBO to more than $68 million — up nearly 36 per cent annually — driven by growth from established and new breweries. This document was published on September 23, 2015 and is provided for archival and research purposes.